Boss is offering their lighting products for dealers interested in using our lighting as a re-rental service. Boss is a specialty lighting manufacturer and supplier of portable lighting, confined space lighting, temp power, gen-sets, and stadium light towers. When reviewing Boss LTR’s product line, you’ll find our many styles of Light Towers, Portable Lighting and Temporary Power Products that are available for rental. Boss will work smart and diligently to help you achieve success. Get registered below for more information. 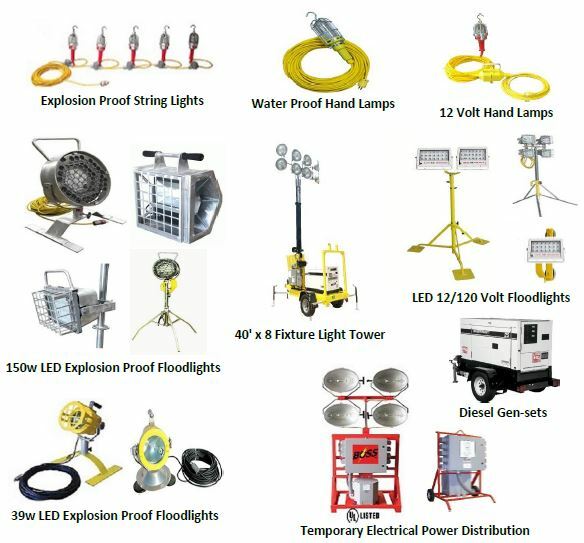 BossLTR offers our USA and Canadian customers a selection of our most popular rental lighting and temporary job site electrical distribution rental products. In the Oil Refinery/Petrochemical Industries, Boss was the first to obtain UL Certification as an Explosion Proof Portable Lighting Assembler for HID Floodlights and one of the first to become UL Certified for Electrical Job Site Power Distribution and the only light tower producer to ever carry a UL Certification. Please tell us a little bit about your rental company and why you're interested in carrying our sports lighting packages..